First Presbyterian Church in Manhattan is home to Lynn Dobson's op. 24, the second of three Dobson organs built in the state of Kansas and one of his largest organs in the region. 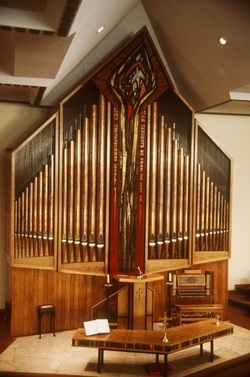 The organ employs mechanical key and electric stop action and is comprised of two manuals, 34 independent stops, and 43 ranks containing 2,096 pipes in a case constructed of white oak. The dramatic facade employs flamed copper pipes of the Pedal Division's 16' Prestant and a mosaic previously displayed in the organ's current location. The manual compass is 56 notes and the pedal compass is 32 notes. Located just one mile from Kansas State University's McCain Auditorium, the church is a readily available venue for student practice, instruction, and performance. This fine pipe organ serves as a wonderful complement to the organs located on campus at Kansas State University. The stoplist is provided below.